Newtonville, Mass. 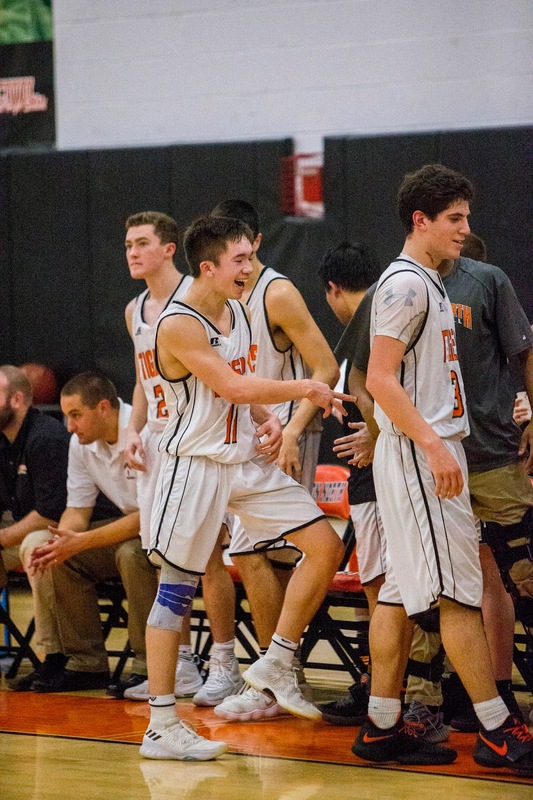 – With the biggest game of the season against Needham coming up on Friday, it was possible that the Newton North Tigers could take their matchup with Walpole (4-8 coming in) lightly. Newton North rejected that possibility with authority on Tuesday night, as the Tigers dominated Walpole wire-to-wire in a 76-38 win. Before the start of the contest, Newton North’s star senior guard Ethan Wright was honored for being in the running to be a McDonald’s All-American. Once the game started, he played like one and set the tone early. Wright exploded for 13 points in the first quarter, as he was able to get in the paint at will and use his size to finish with ease. The scoring barrage from Wright got Newton North out to a 21-10 first quarter lead. However, in the 2nd quarter momentum started to shift to Walpole’s side. The Tigers tried to continue to ride Wright’s scoring wave as the offense bogged down to Wright taking difficult shots without much ball movement. As a result of this, Walpole was able to cut the lead down to five after junior forward Patrick Kearns canned an open triple off a beautiful assist from senior guard Aidan Chariton. This was the closest the Rebels ever got. Right after the Kearns three, Wright aggressively pushed the ball up the floor and got an easy layup. Several seconds later, Wright intercepted an errant pass and drove down for a thunderous dunk that swung the momentum back the Tigers way. In the third quarter it was clear that there was an emphasis placed on more movement within the Newton North offense. The Tigers assisted on six of their seven field goals in the quarter after assisting on only three of the first 15 baskets in the first half. One of the key actions Newton North ran was quick high-low passes into the big men that resulted in layups or swings of the ball that lead to an open three pointers. Three triples were made in the quarter, senior David Sellman, Junior Ezra Pemstein, and sophomore Tom Andreae made one each. The Tigers won the quarter 17-5, which gave them a 50-27 lead at the end of the 3rd quarter. Pemstein in addition Wright proved that he was one of the key play makers on Newton North with his all-around game. From his power forward/center position, he scored 11 points including two three pointers, made a few great passes, and provided space for his teammates with the threat of his jump shot. “This is his 3rd year on varsity and his role has increased each year. When he spreads the floor for us, defending the way he is, and passing the ball he is a really good player. He’s been a big part of our team and I love the way he is playing,” said Connolly. Up next for Newton North is a game they have probably been excited for all year and that is the showdown with undefeated Needham on Friday night.